Tune into Radio Carly: Circa's One Night on Earth at Melbourne Food and Wine Festival. Circa's One Night on Earth at Melbourne Food and Wine Festival. 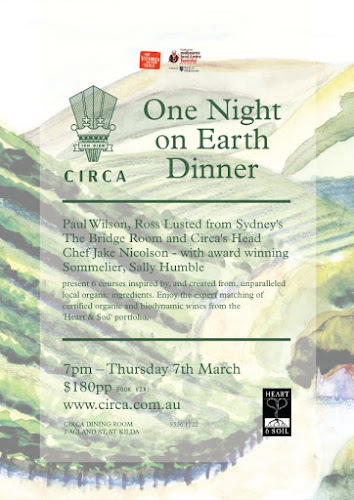 On Thursday night I was a guest at Circa's One Night on Earth - an event in the Melbourne Food and Wine Festival. Circa is at the Prince of Wales in St Kilda - it was a balmy night which made the view of the bay even more beautiful. Three prestigious chefs came together to create the menu - Paul Wilson (Melbourne Pub Group), Ross Lusted (The Bridge Room) and Jake Nicolson (Circa) worked with sommelier Sally Humble for One Night on Earth. Sally was on the microphone throughout the night - she was fabulous - she has a great gift for working with people and wine. Towards the end of the night, the three chefs came out to talk to the room about the food - I loved their passion. As they were leaving, I tapped Jake on the arm, telling him I work with his cousin's wife. Jake and I got chatting about the night, exchanged twitter handles, and Paul joined the conversation. 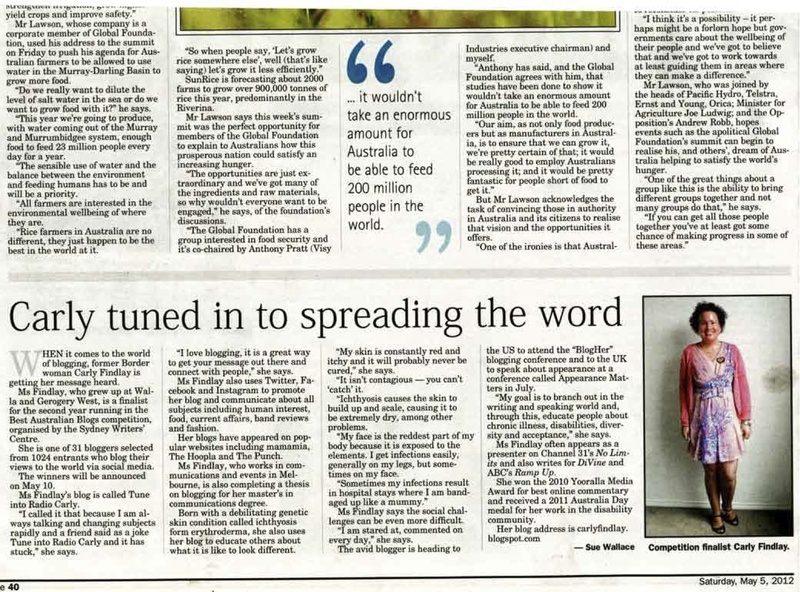 It was interesting to hear how the food supply is affected by the climate - the fish Paul sources has been limited by both the recent fires and floods. Our conversation made me realise just how precious our produce is, and that our ecosystem is so precarious. It certainly reinforces the need to source whatever produce is locally available at the time, and puts the cost of fine dining into perspective. I enjoy learning about the food sourcing and cooking processes as much as I enjoy eating, and I am so thankful to Paul, Jake and Sally for taking the time to talk to me. It was a night of indulgence - with seven courses - eight if you count the seaweed lavosh. There was beautiful food - such fresh produce, and every course was matched with imported organic wine. The premise of the night was to celebrate the earth - 100 people enjoying natural ingredients. The Circa staff made me feel very welcome when I arrived. I was placed on the media table with two real journalists, which makers me feel equally important and amateur at the same time. It's a weird feeling of my writing not quite being mainstream media, and the whole perceptions of bloggers at the moment (my perception included). The journalists were good company - we talked about journalism - the old and the new guard, paywalls, my uni lecturers, and how the great voices can get lost in the Internet noise. I also learnt a little about wine - one of the journalists, Jeni Port, specialises in wine journalism. I learnt to swirl the glass to release the aroma and flavour, and also that wine and food matching is designed to compliment or contrast a dish. I was really pleased that our table was directly under a downlight, so it made it easier to take photos. Though my friends viewing my social media accounts were getting major food envy, with the beautiful Naomi PT playfully telling me to stop it on a number of occasions - deciding that she couldn't be my friend anymore after I posted the dessert photos. If it was any consolation to those suffering from food envy, I felt like a massive sloth after the eight courses, and lay heavily on my bed for some time. So before my table company arrived, I was serve some seaweed lavosh with eggplant dip. The lavosh was deliciously kelpy - a little salty, a little fishy. It worked well with the rich eggplant dip. I liked that because the lavosh was vegetable based, rather than grain based, it didn't fill me up too much. The first course was apple roasted bonito, heirloom vegetable and oyster tarama. The vegetables were lightly pickled, sweet and tangy. Bonito tasted like smoked trout - you can see it at the bottom of the picture. The oyster tarama was a fancy word for roe - and this is where taramasalata dip comes from. I loved the addition of the purple flower petal on the plate - such a pretty salad. Next up was seafood - a mix sourced from Australian and New Zealand. Scallops, mussels, scampi, prawns and abalone. It was served on creamed corn, and topped with what I can only assume was sea cucumber - it had that lightly chewy texture. The scampi was my favourite - it came out of its shell whole, and was so sweet. The corn reminded me of delicious cornbread I had in America. Here is a French wine that I drank before the duck course. It was Chateau Thivin ''Griottes de'en Brulhie", Cote de Brouilly, 2010. It was light and had fruity notes. I enjoyed it. The duck course was my favourite savoury dish. Beautiful presentation and equally as beautiful tasting. On the plate, from left to right is red onion stuffed with walnuts and brioche, ash grilled Milawa duck, pressed fig, mini plums and blood plum vinegar. It was an amazing mix of tart and sweet and rich fatty tastes. The stuffed onion was really special - I want to make it for myself. The duck - rich, fatty and tender - was barbecued in aromatic wood chips - the chefs talked about the Robarta grill where they use different wood chips and infused oils to give food different smoky flavours. The translucent fig was delicate, and contrasted the tart plums. It was wonderful. Our fourth course was wood roasted wagyu beef (thoroughbred from Japan), with porcini and farro risotto. The wagyu was meltingly tender - and the elements of farrow and lightly smoked pine mushrooms, combined with the sauce made it very casserole-like. It was rich and earthy, unctuous and I think was the meal that captured the essence of the Earth theme. The farro made a good alternative to aborio rice - it swelled into fat grains, and soaked up the flavour of the mushrooms. So good! I was a bit full by then, but I was intrigued by the ingredients in this first dessert course. I powered on, for it was dairy heaven for me (for someone who doesn't drink milk, I certainly support the dairy industry well!). This one was a Heidi gruyere custard with pomegranate molasses, hazelnuts and nashi. The gruyere custard was rich and tangy, like yoghurt - cut by sweet nashi and the sherry-like wine served with this course. The texture of it was like heavy cream. I was interested to hear chef Paul Wilson speak about how they infused cream with gruyere cheese - so it got a hint of the cheese taste. After this course, I was approaching a food coma. Our waiter told us the first dessert was great, but the next dessert was "OUT OF THIS WORLD!!! ", gesturing his arms excitedly. He was right. It was whole goats cheese wrapped in a brandy snap, scattered with native and wild berries, and dotted with salted caramel and berry sauce. It was beautiful, delicate and flavoursome - I liked the sourness of the goats cheese - it was almost like icecream, firm and frozen - with the berries (raspberries were stuffed with goats cheese). I tasted soft cardamom (amazing) and wild strawberries, which were like Willy Wonka lollies - superpowered strawberries! If the taste wasn't amazing enough, I was besotted with the presentation - including the gold leaf berries. Gold leaf you guys! The golden berries weren't the end of the meal - we were presented with petit fours. I couldn't capture the colours properly, no matter which instagram filter I used. From the back: white and milk chocolate choc tops filled with a mild mint ganache (held upright in a cup of lentils), sparkly biscuits with a peanut topping, and neopolitan marshmallow cakes - they look like little breasts actually. The marshmallows were my favourite. I had two. Circa's One Night on Earth was really special. I came away from it feeling incredibly full, but I took pleasure in experiencing fine dining prepared by some passionate chefs, beautiful wine that I wouldn't ordinarily drink, and some new company. As my new chef friend Jake Nicolson tweeted to me, "we are very fortunate to have all these beautiful things at our doorstep." The cheese looks SO GOOD. I love cheese and that just looks like pure heaven to me. All the food looks so exotic! The cheese!! my goodness that looks and sounds totally amazing!